Civilian-soldiers, most of them volunteers, comprised the bulk of Canada’s overseas military. In the war’s early years, most Canadian troops were not Canadian born. In the First Contingent that went overseas in late 1914, 70 percent had been born in the United Kingdom. This reflected pre-war immigration from the British Isles and the patriotic ties between recent arrivals and the mother country, but it was still a high number. In Australia’s first contingent, for example, 73 percent were native-born. At war’s end, despite the compulsory service imposed by the Military Service Act, only 51 percent of the Canadian Expeditionary Force (CEF) was Canadian-born. The comparable figure for Australia was 84 percent. lack of support for the war among Quebec’s social and political elites, except in Montreal. Of the almost 620,000 Canadians who enlisted voluntarily or were conscripted, roughly 424,000 served overseas in the Canadian Expeditionary Force. Most Canadian soldiers were between the ages of 18 and 45, as per regulations, but thousands served who were younger or older, lying about their birth date to enlist. The oldest recorded member of the CEF was 80, while the youngest was ten. The average age of the Canadian soldier was 26. Eighty percent of the CEF were bachelors. Most recruits were literate, but they would not on average have stayed in school beyond Grade Six, as was customary in Canadian society at the time. They carried overseas a strong culture of music and singing, informed by social custom, education, and religion. The CEF was a religious army and most soldiers upon enlistment noted their religion on their Attestation paper. Patriotic romanticism reinforced by official propaganda forged a reputation that the Canadians were an army of fearsome lumberjacks, voyageurs, or cowboys, but most had been pre-war labourers, white-collar workers, or farmers. The Canadians nevertheless took great pride in differentiating themselves from British troops, even – or perhaps especially – by their well-documented tendency toward indiscipline. Soldiers of the First Contingent especially were noted for pushing the boundaries of proper military behavior, calling officers by their first names or refusing to salute. By 1917, senior commanders, including Sir Douglas Haig, recognized the Canadians as an effective military force, but their carefully self-cultivated reputation for restlessness, brawling, and indifference to military etiquette continued throughout the war. 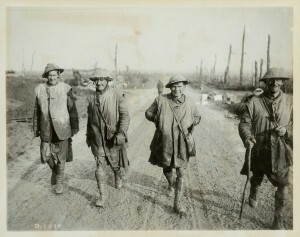 Four Canadian Highlanders smile as they walk along a muddy path away from the front lines. Kilts and bare knees can be seen beneath the veneer of mud. The three soldiers on the right wear respirator bags slung across their chests; all four wear the popular sleeveless leather jerkin.